Blog | Jonathan Matthew Smucker | Be the change you wish to see in the world. State power is also important. Be the change you wish to see in the world. State power is also important. Order Hegemony How-To from AK Press. Order Hegemony How-To from Amazon. Hegemony How-To is a practical guide to political struggle for a generation that is deeply ambivalent about questions of power, leadership, and strategy. Hopeful about the potential of today’s burgeoning movements, long-time grassroots organizer Jonathan Smucker nonetheless pulls no punches when confronting their internal dysfunction. Drawing from personal experience, he provides deep theoretical insight into the all-too-familiar radical tendency toward self-defeating insularity and paralyzing purism. At the same time, he offers tools to bridge the divide between anti-authoritarian values and hegemonic strategies, tools that might just help today’s movements to navigate their obstacles—and change the world. Jonathan Smucker is the Director of Beyond the Choir and has worked for more than two decades as an organizer and strategist in grassroots social movements. His writing has appeared in The Guardian, The Nation, The Sociological Quarterly, and elsewhere. —Andrew Boyd, co-editor of Beautiful Trouble: A Toolbox for Revolution. My short posts are mostly at Medium now. Our apologies, good friends, for the fracture of good order, the burning of paper instead of children, the angering of the orderlies in the front parlor of the charnel house. We could not, so help us God, do otherwise…..We say: killing is disorder, life and gentleness and community and unselfishness is the only order we recognize. For the sake of that order, we risk our liberty, our good name. “Which one is free?” FBI agents finally catch up with Berrigan on Block Island. Daniel Berrigan’s moral actions provided a defiant moral example to a generation trying to make sense of itself and the world as it came of age during the Vietnam War and the military draft. His four-month evasion of the largest FBI manhunt in history (up until then) was pretty badass too. As the long sixties came to a close and as Reagan rose and the conservative offensive ensued—and it often seemed as if the culture itself had turned against social justice ideals—Daniel Berrigan continued his faithful witness against war and militarism, along with his brother Phil, his sister-in-law Liz MacAllister, among many others. Daniel used his beautiful poetic voice to indict injustice and cruelty, while he himself faced one legal indictment after another for putting his body on the line in acts of peaceful civil disobedience. Dan and me. Protesting President Clinton’s plans to bomb Iraq. Ash Wednesday 1998. 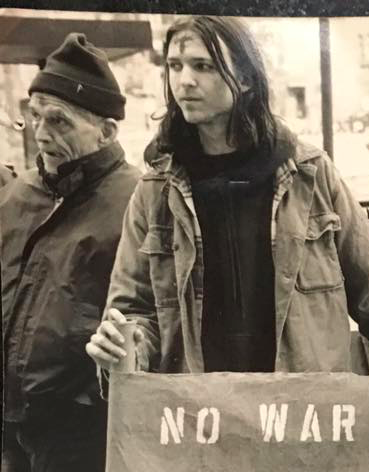 Almost two decades ago I was arrested for the first time in Manhattan, alongside Daniel Berrigan, Carmen Trotta, and Jeremy Scahill. We were outside of the Israel Consulate protesting the ongoing imprisonment of nuclear whistleblower Mordechai Vanunu. 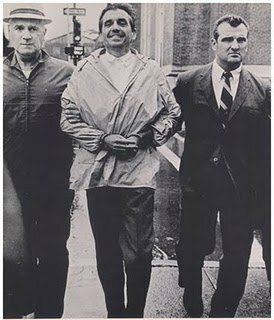 This was just another day in the life of Daniel Berrigan, whose faith demanded of him to stand with the oppressed; to stand peacefully but in disruptive defiance of the culpable authorities. But the Panama Papers are the tip of the iceberg. What you need to know is that rich people tend to want to pay less taxes. Who can blame them? Well, most of us can blame them, actually. And some wealthy people are perfectly happy to pay their fair share in taxes, as they should. In today’s economy, wealth aggregates in the most arbitrary ways. Wealth accumulation has become mostly divorced from social goods. For example, does a copious amount of money aggregate around a public school teacher? Not the last time I checked. How about a janitor? How about a social worker? No dice. The people who are doing the best financially today—I’m talking about the people who are rolling in it—are the people who are using huge sums of money to get more huge sums of money. They didn’t work harder than that janitor or social worker or day laborer or small business owner or school teacher. And they’re only able to accumulate all this capital on top of the public infrastructure that we all build together. ‘The market’ is not a natural phenomenon like the weather. It is shaped by political decisions. We can make those decisions together as a society. We can decide what social goods to fund, for example, and how to fund them. That’s called democracy. Or we can let the richest people make the decisions, and you can bet that they’ll decide that they should be less regulated, more subsidized, and less taxed. That’s called oligarchy. Decisions decisions! When will pollsters stop asking people — especially young people — how “liberal” they are? Among those aged 40 and older, Clinton’s margin against Sanders was largest with moderate and “somewhat liberal” Democrats, while Sanders performed best among the very liberal contingent. But that pattern is erased — or even reversed — among younger Democrats. Clinton lost younger voters by at least 40 percentage points, regardless of their ideological leaning, and the margin was actually largest (58 points) among those calling themselves moderates or conservatives. What’s wrong with this story and also the entrance poll (conducted by Edison Media Research) is that it fails to question the term liberal and what it conjures for young people. I’ll give you a hint: it means something very different for young people than it means for older people. It’s not so difficult to understand this. Conservatives have been conducting an effective negative branding campaign aimed at the term liberal for four decades now. (Importantly, the equally ambiguous terms conservative and moderate have not been systematically targeted in this way, which may account for young people having fewer misgivings about identifying as such.) For young people, the term liberal is thoroughly tarnished and there doesn’t seem to be much worth saving. However, ask young people about their positions on issue after issue, and a very different picture emerges. They want to regulate Wall Street, a public healthcare system, a sane climate policy, and to tax the rich. Heck, even ask young people about socialism (as Pew did), and today’s young people favor it over capitalism. The thing is, they—we—don’t consider this to be a liberal position. And why should we? Those who have brandished the liberal label most visibly over the past few decades—especially Democratic politicians—have often gone hook, line, and sinker for neoliberal free trade policies that have further consolidated the wealth and power of the extremely rich. For this reason, many of the most politically developed young progressives (a label that polls much better, btw) have become increasingly critical of the limits of the project of liberalism itself. We want a whole lot more. Dastardly socialists fighting for the common good. There’s a lot wrong with how pundits (among others) tend to talk about movements. They may say, for example, “Occupy Wall Street — what did it accomplish? It didn’t go anywhere. 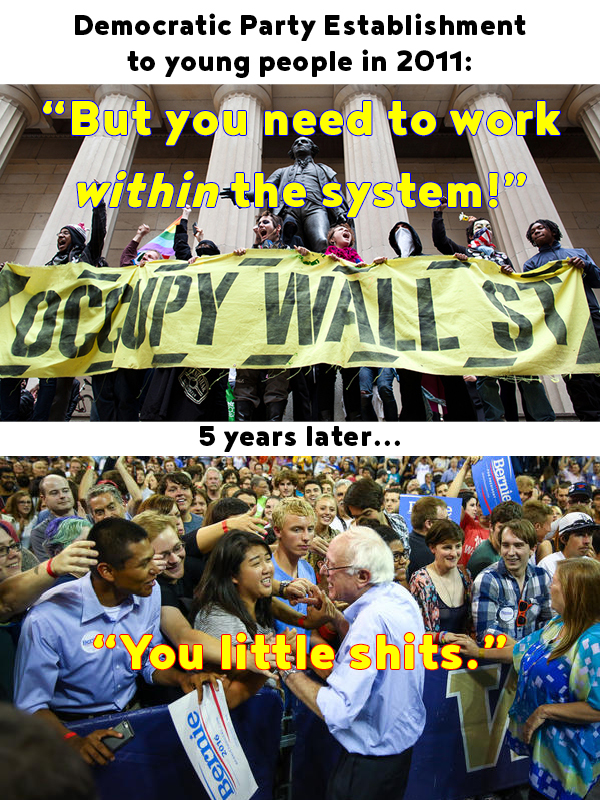 Where is it now?” And what they fail to see is that Occupy Wall Street was not about itself—was not about existing forever as a thing. The moment of Occupy Wall Street served to name crises that are still with us: unconscionable economic inequality and a political system that has been rigged to maintain the privilege, power, and concentrated wealth of the few, against the interests of the many. Solving these crisis was not the exclusive burden of occupiers in a public park in New York’s financial district; solving these crises is up to all of us. Along similar lines, “Is the movement fading?” is an imprecise and unhelpful question to ask about Black Lives Matter. We might instead inquire about the crises named by the movement: continuing anti-black racism in US society, police violence against communities of color, an out of control criminal justice system… How do we as a society remake our culture and our institutions to redress these grievances? That is what a ‘movement’ demands of each of us. And if a movement apparently fades prior to succeeding, that doesn’t mean that we’re off the hook, so long as the problems remain. So when the physical occupation of Zuccotti Park came to an abrupt end in November 2011, ‘the movement’ was pronounced dead. But that’s not how long-term social movements work. If the crisis still exists and is still worsening, people will find a way to manifest a challenge to the structures that perpetuate the crisis. Maybe it lies under the surface for five years, and maybe it re-emerges in the form of an insurgent presidential campaign. The thing is, the point of a ‘social movement’ is not to exist in perpetuity; the point is the movement of the social fabric, the reshaping and restructuring of relationships of power and economic production and distribution. A movement is not a neatly delineated thing. Look for a movement’s edges and they will elude you. Rather a movement is a reflection of society itself, drawing attention to parts of society that are in need of attention. And it is also the collective vehicle for challenging entrenched power, and ultimately maneuvering the political terrain in order to remake society along different lines. 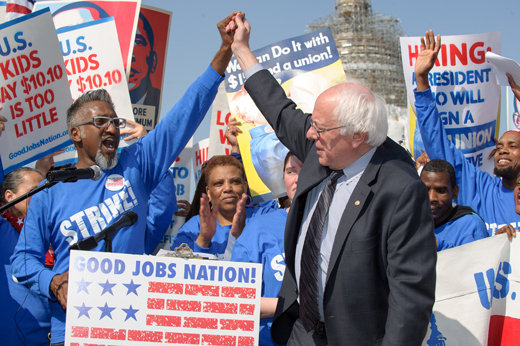 I do not know if Bernie Sanders will win the primary or the presidency. But I do know that the Sanders campaign is another notable symbol of the challenger political alignment that is still coming into being. It is an alignment that has fundamentally broken from the logic and mandates of Wall Street; an alignment that asserts that people are more important than profit, that the life and health of our communities is more important than the dictates of high finance. A fundamental step forward that this alignment has to figure out is how to articulate an economic populism that is not — by design or by neglect — for whites-only (a direction tragically taken by most other populist moments in our nation’s history). If it succeeds, this alignment will encompass many moments and perhaps even many movements. We are finding a way forward. We will make many mistakes and flounder here and there. Many of us are political orphans who have come of age in an era which we were told was the “end of history.” We were told that “there is no alternative.” We have had to figure out an awful lot with too few mentors. What we have going for us is that progressive ideas are popular, despite the noise of the conservative media machine proclaiming the opposite. The conservative project of the past 3+ decades — the hegemonic alignment of Wall Street and socially conservative whites (many organized against their own economic self-interest) — came to fruition in the G. W. Bush years and it failed miserably. 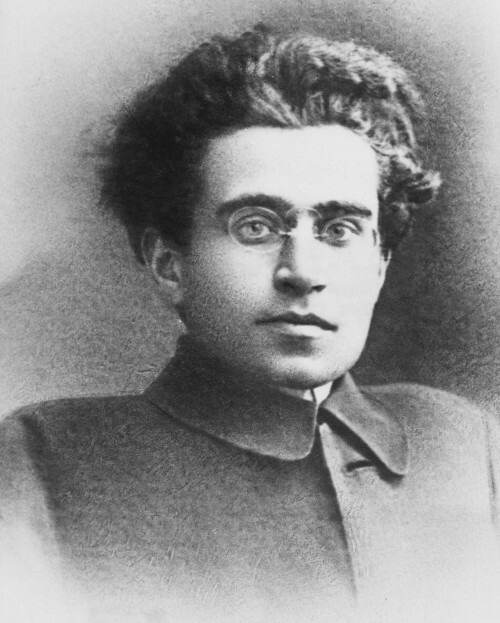 Progressive ideas are increasingly popular today. It’s just that progressives have been shut out from the political machinery. It will take time to rebuild the emaciated progressive infrastructure we have inherited. But so many of us — more and more each year, it seems — are ready to resume the project of building a society that is based on social justice; a society that is for all of us. The voices of hatred are too often louder than the voices of love and compassion, but do not mistake the loudest voices for the society. We must not let these voices speak in the name of ‘the American people.’ Our nation has some horrific legacies that we have to own up to. But we should not forget that we also have the legacies of those who stood up in the face of injustice, who spoke up, who resisted, who worked tirelessly for a better world. Whether the scapegoat is Jews or Muslims or blacks or Mexicans or gays or refugees or communists or heretics or witches, we have heard this tired, dangerous storyline before. We can look for inspiration to those who stood up to such fearmongering. We can join them. There is still more love in this world than there is hate. Important news today. 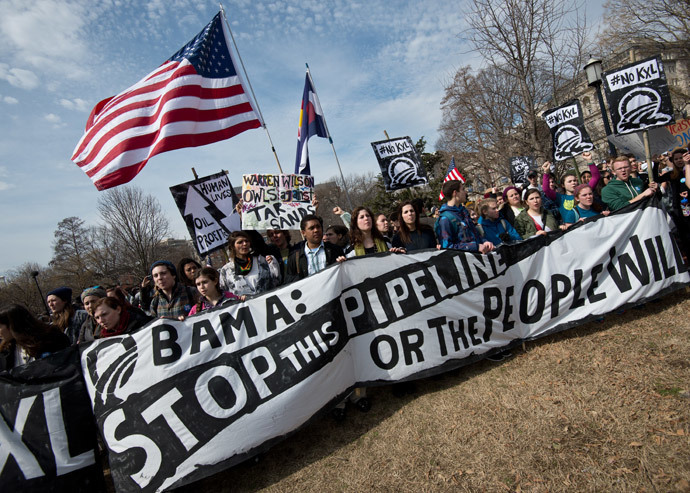 I feel so proud of all my friends, colleagues, and comrades who chose to intervene in history, to challenge ‘fate’, to not be indifferent about humanity’s future, to work to stop the Keystone XL. This victory is not everything, but it is certainly something—something important—in this age of resignation and hopelessness. May it be a harbinger of even bigger things to come. I am proud of you, every one of you, my dearest family, you who have chosen to not be indifferent. We are relaunching our website this fall (2015) in order to reflect the current training and movement support work of Beyond the Choir. The current site was constructed to serve as an online forum for grassroots mobilization — for people who are working for social justice to share practical strategies, tactics and tools, and to analyze the constraints and openings in our political terrain. We will be archiving past posts so that they are still available, but the new site will serve our organizational mission. Please check back this fall to find out more about Beyond the Choir’s work. Subscribe to Jonathan Smucker’s email list. Sign up to receive my articles and periodic updates about my political work (low volume of email).